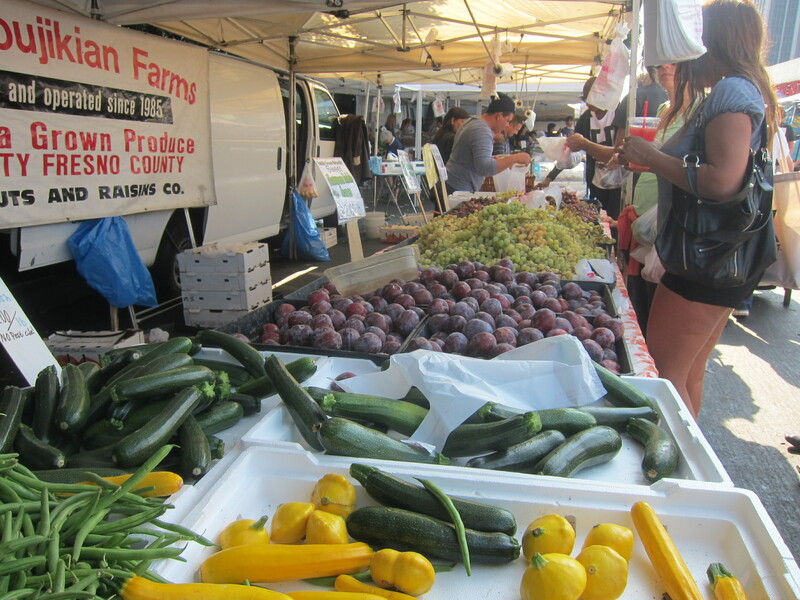 Of the eighty or so weekly farmers markets in Los Angeles County, the biggest and best is the one that pops up every Sunday in Hollywood. Branching out in all directions from the intersection of Vine and Ivar, the Hollywood Farmers Market is the perfect place to spend an hour shopping for organic persimmons and sampling artisan goat cheese while listening to a heavily tatted hipster discuss fair trade co-ops with a dreadlocked neo-hippie. 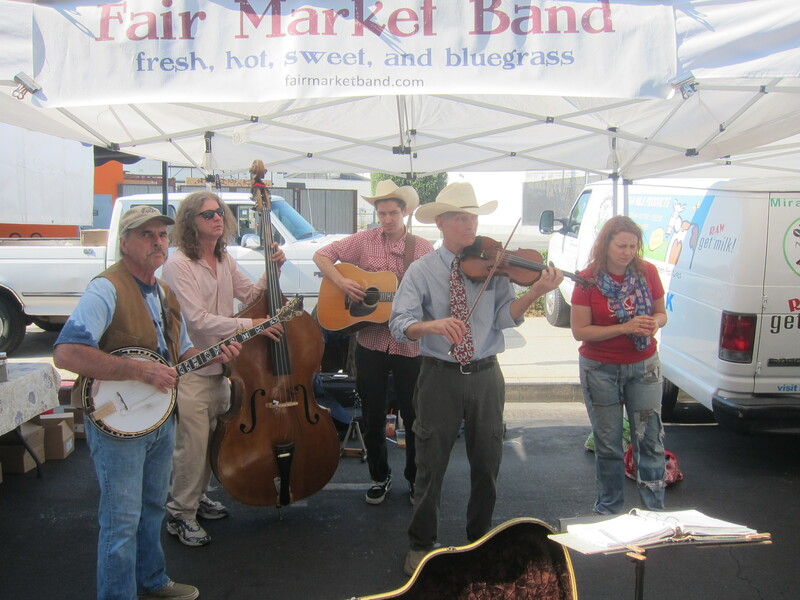 Musicians are scattered throughout, including a bluegrass band, a reggae drummer, a guy that makes music with rubber bands, and my favorite local hot jazz combo, The California Feetwarmers. The prepared food section has a lot of great choices, but Delmy Pupusas is my favorite. 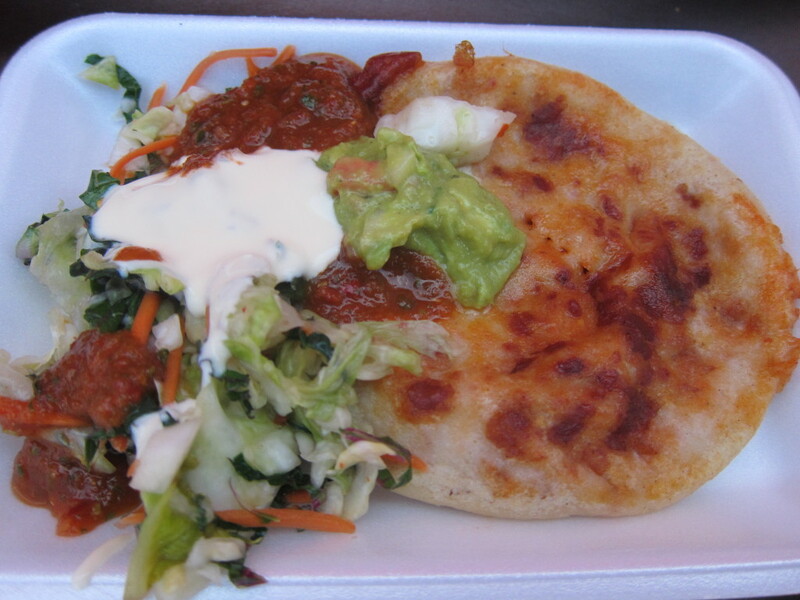 Pupusas are a popular street food in El Salvador. They’re thick round corn cakes that are stuffed with a variety of fillings such as cheese, vegetables, beans, shrimp, chicken and chorizo, and cooked on a griddle until golden brown. Delmy serves these hot stuffed Salvadoran treats with homemade salasa, a spicy and vinegary cabbage relish called curtido, guacamole and some fresh crema. 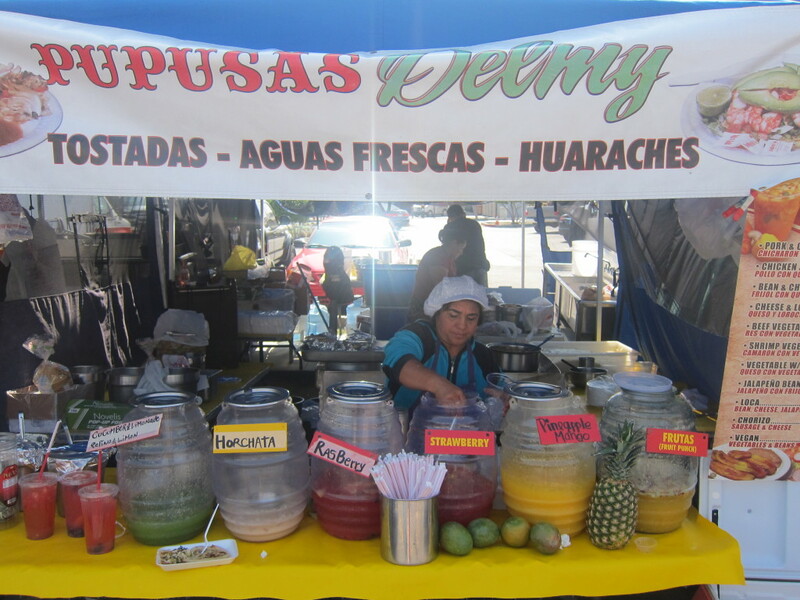 A couple pupusas make a nice hearty lunch and are best washed down with Delmy’s homemade horchata or agua fresca, which comes in several flavors including watermelon, strawberry, mango and raspberry. 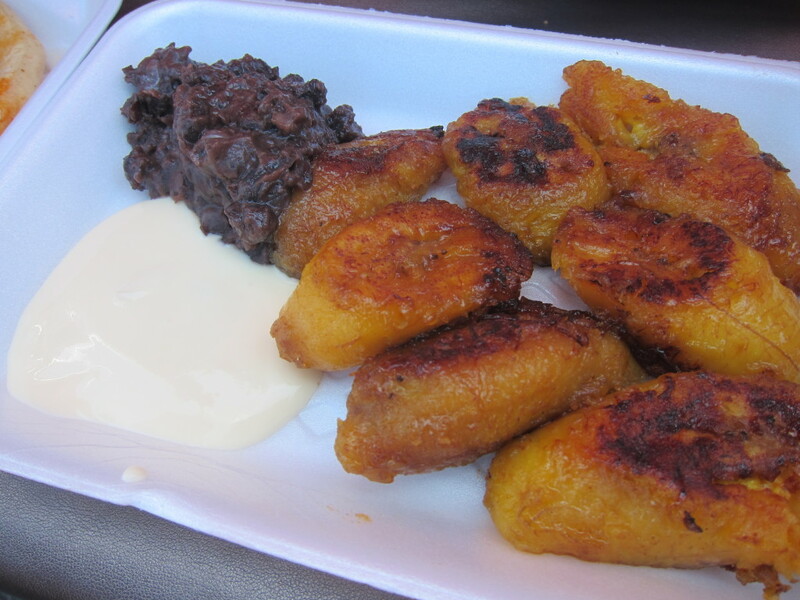 For dessert, I recommend an order of Delmy’s fried plantains served with a side of black beans and fresh crema. Muy delicioso! 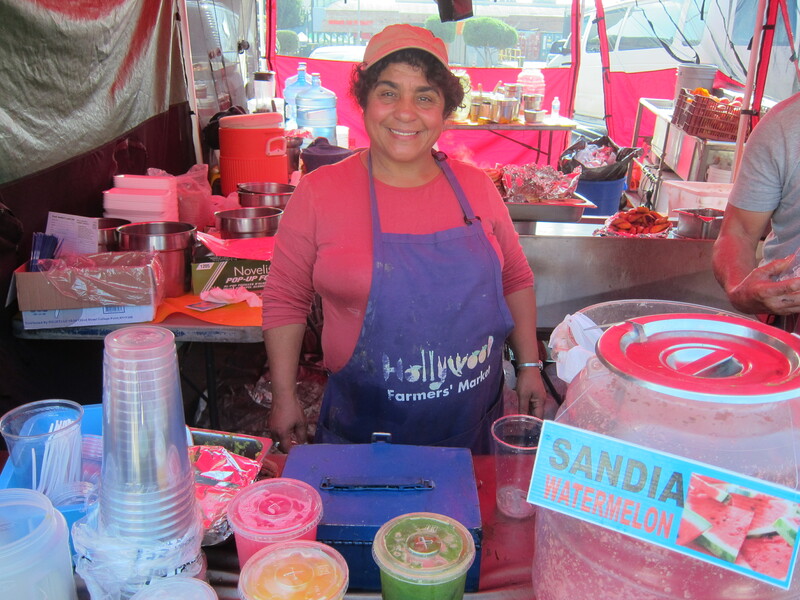 Delmy Pupusas can be found at the Hollywood Farmers Market every Sunday morning and early afternoon and at several other farmers markets including Torrance, Downtown in Pershing Square, Atwater Village, Echo Park and Silverlake. 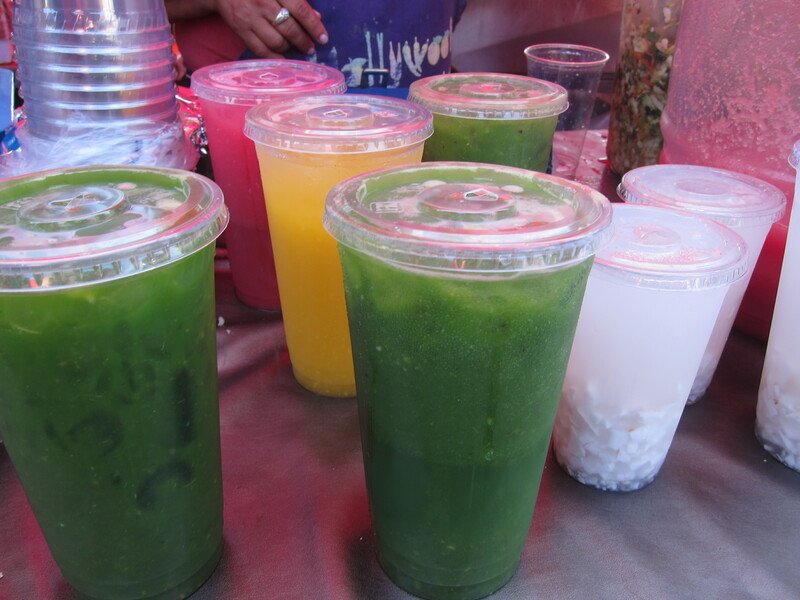 Enjoy your pupusas with some live music. Looks soooooo good. I am going to make the trip just for this 🙂 Thanks!